NUCA (Norwich University College of the Arts) was the last stop on the travelling roadshow of the Jerwood Painters exhibition – NUCA (previously the Norwich Gallery) also annually hosts the established EAST International. Last week I went to see ‘Jerwood Painters 2009‘ in spite of the fact that the 2010 shortlist was recently announced – but this show was all new work to me. The selectors, all of whom are practising painters, and are or have been, visiting lecturers at some of London’s art colleges, were: Mali Morris, Alexis Harding and Phillip Allen. 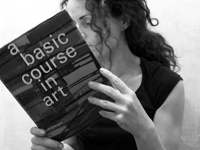 Their selection criteria focused only on recent art graduates, of the significant ‘emerging artist‘ mould. A scan through the JP catalogue showed that most of the twenty six selected artists had both studied and now work in London. With these simple facts in both mind and hand, my thoughts were racing – I see where it’s coming from, but where is painting intellectually headed in the UK? I was pleased, if not surprised, that I had the exhibition all to myself (aside from one ’student’ invigilator) – this show was not curated to be a crowd-pleaser. 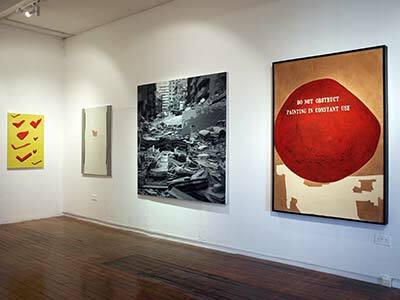 It is clear from the selectors’ foreword that they were responding to contradiction and controversy to further the debate or critique on contemporary painting. As Alexis Harding said: In their own specific and personal way these artists extend and corrupt a particular investigation into painting. 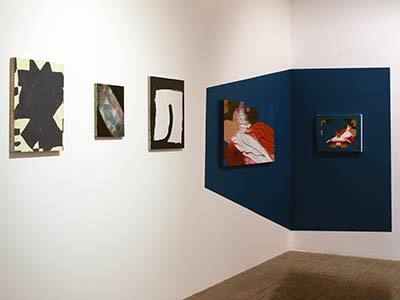 NUCA was not the best of spaces to view these selected paintings; some works were in the direct glare of the long window, whereas a temporary partition wall created dark corners with some works seemingly wedged into them, deliberately so in the case of Michael Cassidy’s offering, as seen below, Single sparks are spectral fires. It was refreshing to see many smaller works on show (when the history of painting is saturated with monumental works) but these three small paintings, when hung together in a row, were quite indistinguishable from one another - they could have been painted by the same hand. It is very difficult to make a value judgement on contemporary painting based on a single piece of work; they either instantly succeed or fail miserably. Of these four paintings, Paul John Taylor’s ‘Bombed Beirut‘ invites the most scrutiny – clearly the appropriation of a documentary news image, looking decidedly ‘photoshopped’ then blown-up in scale . The jagged, cut-out, posterised edges of the grey monochrome paint render a scene of utter devastation into a surface of pure pattern. It echoes the the camouflage of combat fatigues, and it also emphasises the explosive shards of metal, concrete and glass. I was reminded of Andy Warhol and his de-sensitising of shocking media images, such as the Car Crash series. You can view Taylor’s ‘Bombed Beirut‘ painting on Saatchi, where you will find that appropriating and reworking media images is a key theme in his work. Bombed Beirut is a painting of considerable skill but I couldn’t let go of the prior knowledge that I brought into my immediate reading of it. There have been many instances of news photographs being manipulated to question or change their meaning and I wasn’t sure how much this painting added to the current debate surrounding the role and influence of the (twenty-four hour) news media. As a formally abstracted, fractured image, it is a fascinating composition (in the structured patterning and carefully applied tones of grey), and I sensed he wanted the viewer to question this moral juxtaposition, of a surface aesthetic versus a pictorial horror. 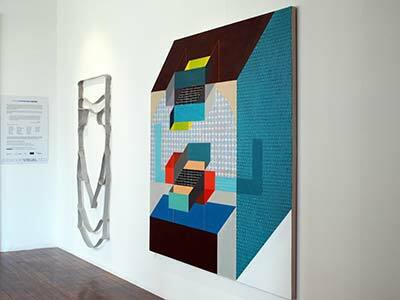 Egan’s work, Interior is a construction of cardboard, tape, paint, varnish and copper nails. In truth, I didn’t get it. I thought that maybe it was referencing an architectural model or a floor plan, but it looked like it might have been rescued from a skip – a reject, an abandoned idea, a project shelved. Was this the decline of modern architecture, or was it just the interior of some packaging? It was empty, lifeless, but perhaps that was the point. Ellen Stanford’s painting The first marriage, is art that needs a big white wall in a big white space. It was visually tantalising in its carefully constructed geometric abstraction, in the play of flatness with perspective, pattern with solid, interior with exterior and vibrant interactions of colour. It also had an odd familiarity about it, in that you think you’ve seen it before – a melding of lots of influences from Bauhaus to Op art. The title, for me, was humorous, absurd, but in the end irrelevant – I didn’t see any need for an implied narrative or reference to bring it to life. This painting was a visual feast for starving eyes. William Monk’s Untitled I is another of the large paintings on show, and, with its reference to the environment, most appealed to my own artistic sensibilities. The deepest viridian green-black swamps a seemingly magical forest below – or is it a coastline, a small tropical island – I couldn’t be sure. Untitled I doesn’t give me the key that I need into unlocking any deeper understanding of this painting. It could be alluding to global warming, it could be an undiscovered paradise island, or it could be a Ballardian nightmare. Yet again, more questions than answers – but there again, that is the point of this exhibition. 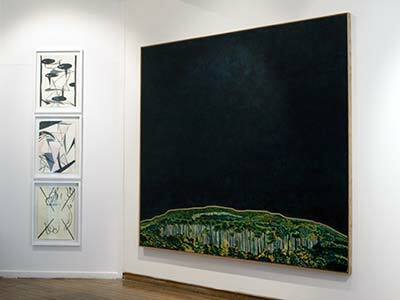 Matthew Musgrave, Scott O’ Rourke, Paul Doran and Aidan Doherty deserve a quick mention with their small-scale works, easily overlooked and crowded out by the bigger paintings in the show. In the more figurative works in the exhibition there seemed to be an undercurrent of bad painting being offered up as good painting, challenging the aesthetic – Hartley, Stanners and Busuttil all got messy with the paints just like Georg Baselitz or Stella Vine. Two exceptions would be Matthew Weir’s macabre Serenade melancolique and Ryan Moseley’s pop-surreal Psycho Cubist Picnic. Other works just failed to register – not one thing or the other, gestures in paint on canvas that never asked for more than a passing glance. There were twenty-six painters and thus twenty six paintings in this exhibition, with a good mix of small works in with more monumental pieces – and nearly all are on canvas, either oil or acrylic. It was disappointing that they seemed not to look (with a few exceptions) much further than London art school graduates to select their emerging new painters. Barry Schwabsky, in his catalogue essay, The contradictions of Art, writes that if you have to ask the question, what is the ‘state, condition, prospects, future, or situation of painting‘, then his first reply would be: who’s asking? – that only those who are worried about painting or feel inferior as painters would need to ask the question. But painting, if seen as the overlooked, undervalued, underfed underdog in contemporary art, will breed a fiercely competitive animal. He contends that tension and contradiction is a requirement in art, that one type of art needs another type of art, they may clash or oppose one another but they will co-exist, are made stronger by their struggle or differences. I have focused here on the paintings that provoked the most thought; it would be very time-consuming to critique here each one in turn. There was good painting and bad painting, high ideas and low ideas, large scale and small scale, pop and politics, the macabre and the mundane. On the slim evidence of these twenty-six paintings, I was not entirely convinced by the Jerwood judgement – that this exhibition reflected the next generation in painting. I was still asking the question, what is the state, condition, prospects, future or situation of painting – and I am a painter – but if the answer is controversy and contradiction then this exhibition justly delivered. This entry was written by Jazz, posted on February 23, 2010 at 11:15 pm, filed under artist journal and tagged exhibition, jerwood painters, norwich. Bookmark the permalink. Follow any comments here with the RSS feed for this post. Both comments and trackbacks are currently closed. jazz green is the author of all content (except where otherwise credited).